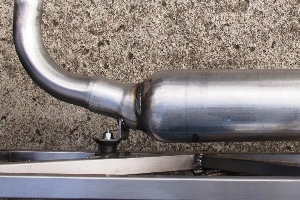 Our muffler finally arrived! 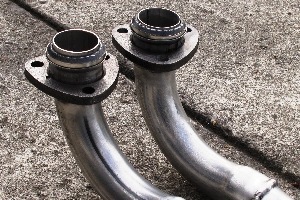 It seems like our supplier's strategy of delivering everything under the radar in bits and pieces has paid off, and so we managed to complete our exhaust system without any further interference from the government. Or "gummint" as we like to say down here. In Marin County. The only tricky part was the downpipes. 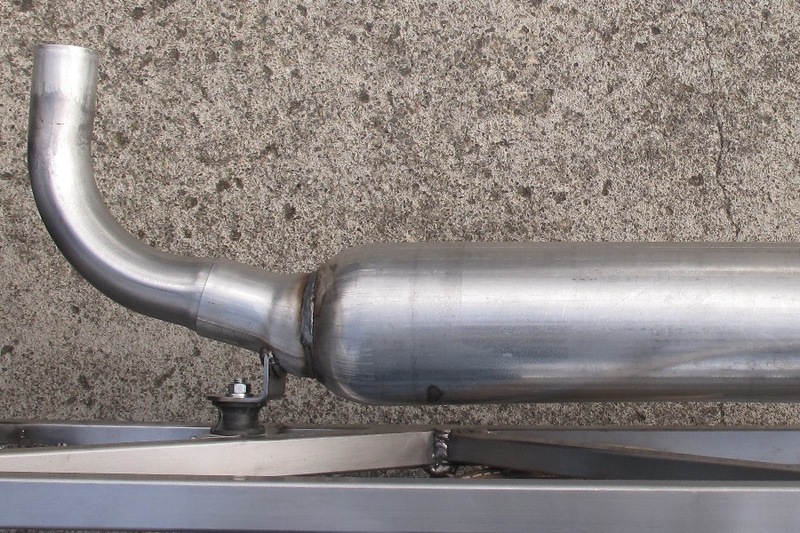 The rest of the exhaust is welded together, but the downpipes bolt to the exhaust manifold, and will therefore leak unless you can figure out a way to stop it. We're not so worried about dangerous exhaust fumes escaping into the engine bay, but a leak will be noisy, and possibly messy. In order to minimize the risk of leaks, M.G.s (and probably most other cars) use gaskets. We want to use gaskets too, so we tried to copy the original MGB downpipe connectors as best we could. We hope they work. Welding exhaust parts was easy, but we weren't sure what to do about the aluminum coating on the pipes, whether or not it needed to be removed. So we consulted our favorite welding expert, the Internet, which turned out to be split 50-50, half saying to sand off the aluminum, the other half telling us to weld right through it. So that's what we did. We sanded off the aluminum on half the pipes. Not necessarily on purpose, but sometimes you remember to do things, and other times not so much. But the result looks the same either way, so we're good. 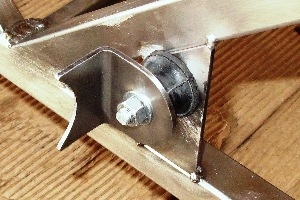 Locost exhaust hanger, a.k.a. "cotton reel"
The exhaust system went together pretty much exactly how we drew it up. We did have to figure out a way to mount it though, since we never actually drew up that part. The Locost book is not a lot of help here. It allocates all of three pages to the exhaust system, two of which are mostly pictures, and on the subject of exhaust hangers all it says is, "make something that works". I may be paraphrasing. For our exhaust hangers, we decided to go with what the book calls cotton reels, and Moss Motors calls bobbins. I think we'll call them hangers. Originally we planned to use a single hanger. The book alludes to the possibility of more, but we were a little concerned about using two. We think one would support the side pipe well enough, and the rubber hanger would be free to flex when the engine leans over under the massive torque produced by the MGB powerplant. 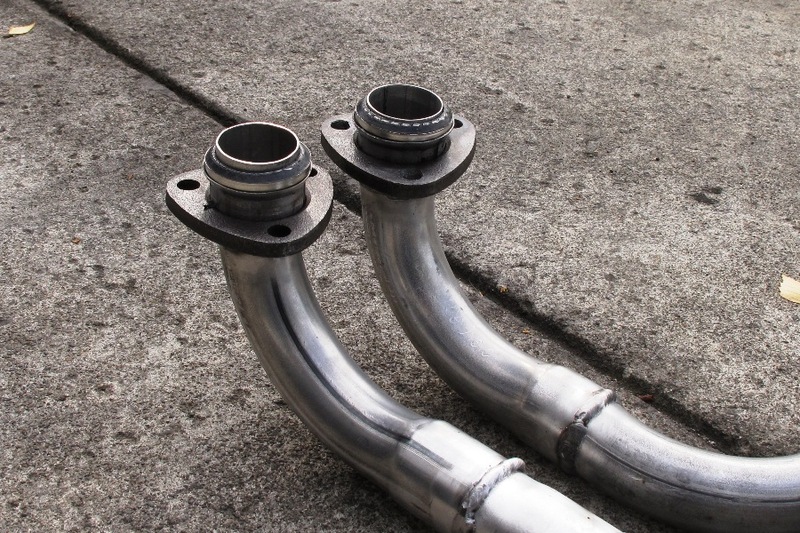 Two hangers would support the side pipe better, but would restrict the pipe's movement, putting a lot of undue stress on our exhaust system, which, along with the usual due stress, might prove too much for our welded seams. But we weren't sure. This was one of those cases where real engineers would know exactly what to do, and we wouldn't, so we had to compromise. We welded two hanger attachment tabs to the Locost frame, one in front of the muffler and one behind, but only attached a hanger to the rear tab. Once the engine's running, if it turns out the muffler is banging all over the place, we'll add the second hanger. If it isn't banging all over the place, we'll pull a spark plug wire. If it still isn't banging all over the place, we'll have our answer. May look better after painting. But probably not. So we're basically done with the exhaust, which is kind of a surprise. We thought this was going to be one of those jobs that would require major experience, superior fabrication skills, and all that other stuff we don't have. We worried about clearance issues, and we thought we might not be able to remove the exhaust once we welded it all together. We also expected a lot of do-overs. 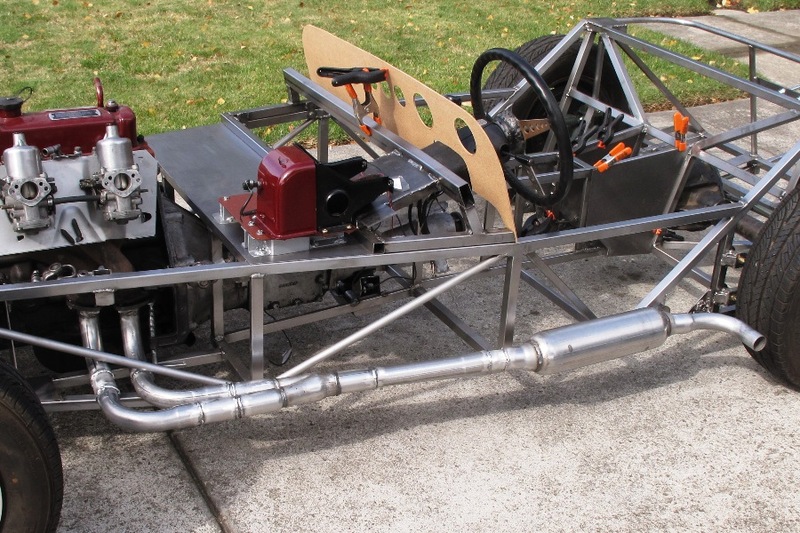 Because of this, we gave the exhaust system a build step all its own, right up there with steps like stripping the donor and welding the frame, and we allocated a ton of hours to it. Incredibly, it took way less time than we expected, and that included several hours peeling labels off exhaust pipes, a difficult task no one could've anticipated. All of the parts for the exhaust came right off the shelf, and everything fit together perfectly. 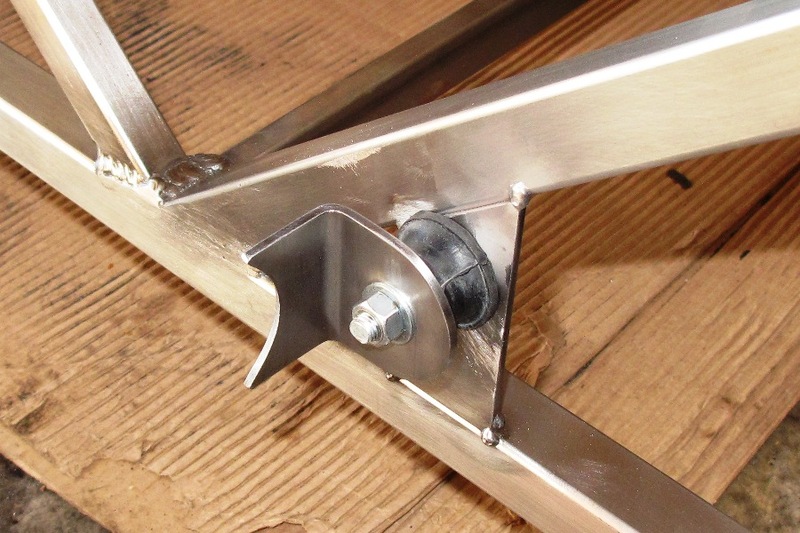 Our meager engineering skills were never seriously tested, hanger mounts notwithstanding, and unless we missed something, which we have to admit is still highly likely, the job turned out to be really easy. We hope we feel the same way the first time we start the engine.